Our most versatile sharpeners, these models can sharpen anything – knives, scissors, etc. Some models have groves for fish hooks. 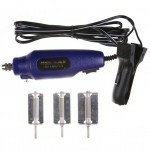 Very effective in hard to get places, carbide table saws blades, router bits, deburring. Many uses include – hunting and fishing knives, axes, woodworking tools and carbides. Diamond Stones are perfect for hunting, and fishing knives, woodworking tools, exacto blades, axes and industrial use. Stones are available in super fine to extra coarse diamond and multiple shapes and sizes. This revolutionary Diamond Sharpener with a Precision Guide will provide the user with a fail safe sharpening system that will sharpen faster and more accurately than competitive products. The EZE-LAP in the quickest, easiest and most economic sharpening system available.